With her dreams of dominating Melbourne's fashion scene in tatters, Nella Martini has returned to the last place she wants to be – Torrente Blu, the market garden inherited from her late nonna. She just needs to clean up the property, sell it quickly, and avoid run–ins with her neighbour: surly Adrian Tomaso. 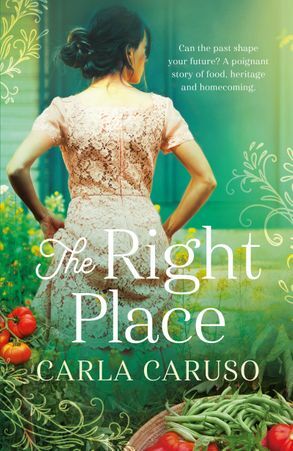 But when Nella comes across her nonna's cookbook things start to change. The place, with its endless tomato plants and gallons of olive oil in storage, gets under her skin, as does Adrian with his passion for this life. But her dreams have always meant being anywhere but here – haven't they? Or has the right place been here all this time? Carla Caruso was born in Adelaide, Australia, and only 'escaped' for three years to work as a magazine journalist and stylist in Sydney. Previously, she was a gossip columnist and fashion editor at Adelaide's daily newspaper, The Advertiser. She has since freelanced for titles including Woman's Day, Cleo and Shop Til You Drop. These days, she writes fiction in between playing mum to twin sons Alessio and Sebastian, making fashion jewellery, and restoring vintage furniture. Oh, plus checking her daily horoscopes, jogging, and devouring trashy TV shows! Find out more on Carla's website. Follow her on Instagram, Facebook and Twitter.